Regeneration. Justification. Sanctification. Glorification. These are all at least recognizable terms even for the theologically-unconcerned Christian. But how often do we think of adoption? Trevor J. Burke recognized that adoption is greatly neglected despite its profusion in Paul’s writings, and Adopted into God’s Family is his attempt to set things right. Burke wisely begins by defining terms and surveying the territory. When adoption hasn’t been neglected, it has been misunderstood: often as synonymous with justification or regeneration. However, “Adoption describes aspects not found in any other of the above soteriological terms Paul uses…if adoption is important and distinct enough…[it] should occupy a more vital role in our theological reflection and understanding” (p28). After discussing metaphor (ch 2), Burke surveys the potential background(s) that informed Paul’s doctrine of adoption; whether the Old Testament, Grecian law or Roman law (ch 3). Burke concludes that Paul viewed adoption primarily through the lens of Roman law with the OT playing a secondary role. Granted, the OT itself never says that Israel was adopted by God but considering Rom 9:4, it is surprising that Burke didn’t assign the OT more influence in Paul’s doctrine of adoption. Next, since each member of the Trinity has a unique role in adoption, and rich chapters of exegesis are devoted to each (ch 4, 5, 6). The Father is the initiator and head of the household (Eph 1; Gal 4:1-7); the unique Son provides adoption to those united with Him, though not adopted Himself (Rom 1:3-4; Eph 1); and the Spirit – in one of the best chapters – assures us of our adoption and is evidence of the redemptive-historical change for God’s people receiving the full blessings of fully-grown adopted sons (Gal 3-4; Rom 7-8). Next, Burke examines the relationship between adoption and honor in the first century world, and how this plays out in Paul’s letters (ch 7): examples being that Paul uses familial language to describe his own role in the household of Christ (Rom 1:1), his relationship to other believers (Rom 1:13; 16:5, 8, 9, 23), and also rhetorically to overcome divisions (Rom 1:7, “our father”; 8:15). Lastly, the implications of adoption’s already/not-yet character are given its own excellent chapter (ch 8). There are many things to commend in Adopted into God’s Family but I will begin with a few shortcomings. Burke excels at the “familial” aspect of adoption, but I believe that he missed important implications of our adoption: inheritance and rule. Inheritance is linked with adoption in Romans 8:17. Burke rightly recognizes that “inheritance” in the OT refers to the promised land, but holds that for Paul, “the term takes on a different meaning rarely found in the Old Testament” (p97), with Roman law providing “a more suitable background” (p97). Whatever the Roman influence, I think Burke errs by stripping inheritance of its OT meaning, and reducing it to “inheriting” salvation and God Himself in some abstract sense. Space prohibits proper unpacking, but the OT and NT recognize that Abraham’s inheritance typologically points forward to the new creation (Rom 4:13; Heb 11:8-11; Matt 5:5) and adoption, sonship, inheritance and new creation are all wrapped up together (Gal 3:23-47, Rom 4:13-14, Rom 8:17-30). In other words, God’s adopted children do inherit “the land”: the new creation. Rulership is also linked to adoption. While no NT text explicitly links “adoption” with rule on a word-level, thematically it is there: we are adopted as God’s sons! But Burke isolates Israel’s sonship as irrelevant to the discussion for being purely “redemptive” and “elective” and not familial (p71); however Paul surely considered adoption as resulting in sonship, so sonship in the OT is very relevant here. I would argue that various “sons of God” in the OT and NT have at least one thing in common: rule under God’s authority. Therefore, divinely-delegated rulership would also be a blessing of adoption. More detail on the nature of Jesus’ sonship could have helped here considering that the NT uses “son of God” primarily not in a divine-second-person-of-the-Trinity sense, but rather as royal/Messianic identification (Matt 16:16; 26:63; John 11:26). The Messiah is God’s ideal king and divinely-appointed ruler who will rule the earth (Ps 2; Ps 110) as Adam was commissioned to do. So in what sense are we “sons” like Jesus? One answer is in rulership. And since our sonship is obtained through union with Christ, then we too are being restored to the image of God (Rom 8:29) and will reign with Christ over the new creation (2 Tim 2:12; 1 Cor 3:22-23; 6:3; Rom 5:17)! With the criticisms over, I can now wholeheartedly praise the book on all other counts. I will list the strengths briefly for brevity’s sake. First, Burke is unafraid to intermingle systematic and biblical theology. For example, he began by discussing systematic treatments of soteriology, and there was no apology for presupposing the Trinity and using it to structure his book! Some may be frustrated that he presupposes some systematic categories in a work of Biblical theology, but for me it was refreshing. Second, Burke’s chapter on the social aspects of honor was unique and very insightful. This was the most surprising chapter in the book as it touched on a lot of areas, including Paul’s abundance of “family” language (brother, sister, father, son, even slave) and also provided a great basis for holiness: adopted children truly are sons, but still need to learn to “fit in” to the way the family does things. God wants there to be a family resemblance (Rom 8:29), and this is a good basis for further sanctification. Third, a large chunk of the book is made up of exegesis both scholarly and pastoral. Burke is careful to let the texts speak for themselves, but also isn’t ashamed of allowing this book to be encouraging! Many scholars don’t find this easy (or enjoyable?) to do, but for Burke it comes naturally from the material. This is top-notch pastoral scholarship tightly bound to the text of Scripture. Read this book and you will have a hard time not rejoicing in God’s act of pure grace in adopting us as His blessed children. 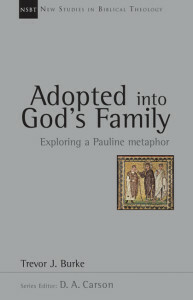 Adopted into God’s Family is a deeply moving book. Even academic rigour and details can’t get in the way of such a rich topic! But Burke goes further; he allows wonder to come through in his own writing. It is clear that his study of adoption has impacted him and it’s contagious. Whilst maintaining my two perceived shortcomings, I’d highly recommend this work to anyone (pastor, student, teacher) interested in the theological depth found in Paul’s “adoption” language. It truly is a wonderful thing to be adopted into God’s family! Did the Apostle Paul Dare to Be A Daniel?